Not everything you find is a great resource. Sometimes the article you think will be perfect doesn't really help. Sometimes the information you find is just unreliable. The web is full of unreliable information, but that stuff can even find its way into books, magazines, newspapers, etc. Ever see someone believe an Onion article? There are a few things you can do to make sure your resources are the best for your research. One is to try to find scholarly and/or peer-reviewed articles, and the other is to apply the CRAAP test to your resources. C: Currency: The timeliness of the information. When was the information published or posted? R: Relevance: Is the information directly related to your topic? A: Authority: The source of the information. What are the author's credentials? 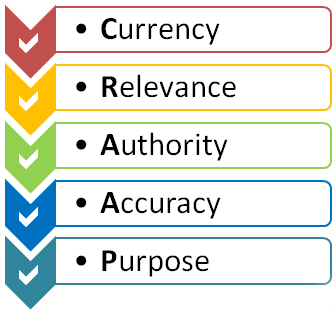 A: Accuracy: The reliability and correctness of the content. Where does the information come from? P: Purpose: The reason the information exists. What biases are involved? Is the information fact, opinion or propaganda? Use this link to print a copy of the C.R.A.A.P. Test created by the librarians at Cal State Chico. See also: a video from Weslyan University about applying the CRAAP test. When an assignment calls for scholarly sources, typically that means academic books and articles from periodicals. A quick rule of thumb for telling whether a source is scholarly is to look for a works cited list or bibliography in which the author refers to the work of other researchers. Also, check Anatomy of a Scholarly Article from the North Carolina State University Libraries. Some scholarly articles are called peer-reviewed as they are critically evaluated for originality, quality of research, and clarity of presentation by the author's peers, i.e., other experts who do research in the same field. If you aren't sure whether or not the group that publishes a journal is "scholarly" or not (for instance, maybe you've never heard of the Modern Language Association and so don't know that it is the association of college and university English professors), you can look at the section in the journal where the list of editors is given. Scholarly journals usually list not only the editors' names but also their academic credentials (what degrees they have earned, or where they are a professor). If a journal offers no such list, then chances are it is NOT a scholarly journal because if it were, it would list the names and credentials of its scholars. You can find this information by looking at a hard copy of the journal or by visiting the journal's webpage and searching for its list of editors. Who wrote the article, and is that writer a "scholar" (see definition of scholar above)? If no credentials of the author are listed, then he or she is probably NOT a scholar. If no author is listed, then the source is definitely NOT a scholarly source. Is the article sponsored by a scholarly organization (such as a university or college or scholarly journal)? If so, it can usually be assumed to be a scholarly source. Magazines like Time and Newsweek often have good information in them, but because they usually do not document how they got that information (whether it came from reliable, well-informed sources or not), and because the authors of their articles are not usually "scholars" (refer to definition above), they are not usually considered scholarly sources.